I think that the Claire Daddy is supposed to resemble a Crawdad. Thus "Daddy" in the name of the fly. Takes some imagination though. 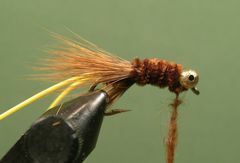 Carter Nelson's materials list in the June 1999 issue of Warmwater Fly Fishing specified small brown chenille and large silver bead chain eyes. I prefer to use extra small (fine) Chenille for the body along with medium gold bead chain eyes. But, to each his own. This is a fairly easy fly to tie. One note of caution. Wet the tying thread with Zap A Gap while your're tying in the Squirrel tail legs. The super glue will cement the hairs to the hook. If you don't do this you risk the chance of the hair falling out while you're fishing the fly. Attach the Claire Daddy to a fairly light tippet (4X) so that it gets to the bottom quicker. Attach the fly to the leader with a fixed loop knot to give it more action. Fish it with short strips anywhere in the water column or bounce it along the bottom. The hook rides "point up" so you don't have to fear the problem of hanging up on the bottom. Before you clamp the hook in the vice, bend it with your pliers so that it looks like this. Slightly bending the hook helps it swim with the hook point up. Clamp the hook in the vice, crimp the barb, and lay down a base of thread from the hook's eye to the hook's bend. Lash the bead chain eyes to the front of the hook with several figure-eight wraps of thread. Leave room for a small thread head behind the hook's eye. Bind a piece of Chenille from behind the bead chain eyes back to the hook's bend. 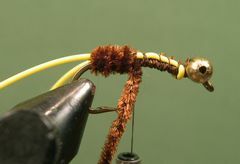 Double the rubber strand and bind it to the hook from just behind the bead chain eyes back to the base of the Chenille. Wrap the Chenille forward for three or four turns until you have covered the rear third of the hook. Then, bind the Chenille with a couple tight turns of thread. Let the Chenille and the thread hang as you prepare the Squirrlel tail legs. Clip a small bunch of hair (maybe 20 hairs) from a Squirrle tail and even the hair tips in a hair stacker. 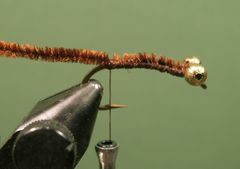 Tie that bunch in on the far side of the hook's shank so that the tips of the hair extend about one-half inch beyond the hook's bend. 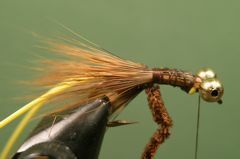 Be sure to keep the tying thread wet with Zap A Gap during this process so that the hairs will be glued to the hook. 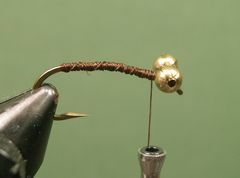 Repeat the same process with a bunch of hairs for the leg on the near side of the hook. Wrap the Chenille forward to the bead chain eyes and tie it in. Remove any excess Chenille. Apply a thin noodle of dubbing to the thread and figure-eight the dubbed thread around the bead chain eyes until you have created a pronounced head around the eyes. Trim the yellow rubber tail to a length that suits you and your Claire Daddy is finished.